We love our 1920’s bungalow but it leaves much to be desired when it comes to security. We’re not paranoid, but there have been break-ins in the area and we want to make sure our home doesn’t become another statistic. We’ve added motion-sensing outdoor lighting, put our indoor lights on timers and raised the height of our backyard walls, but our French doors in the backyard are a liability. The doors are great as they let in a lot of light but the glass would be easy to break, and then with a twist of the lock from the inside a thief could get in. 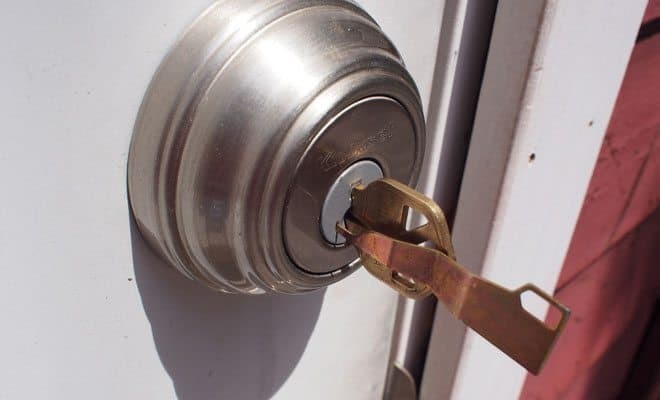 To remedy this we wanted to add double-cylinder locks to every exterior door which require a key to lock and unlock from both the inside and outside. It’s an extra bit of security that can make a world of difference between a robber only getting as far as breaking a panel of glass, to them being able to open the door and walk out with as many belongings as they can carry. Another concern is that we have lived in this house for six years and over time we have provided multiple house sitters, dog sitters, and neighbors with copies of the key. Some were returned, some were not. We also don’t think our landlord ever changed the lock when the old tenants moved out, so who knows how many people have a key. 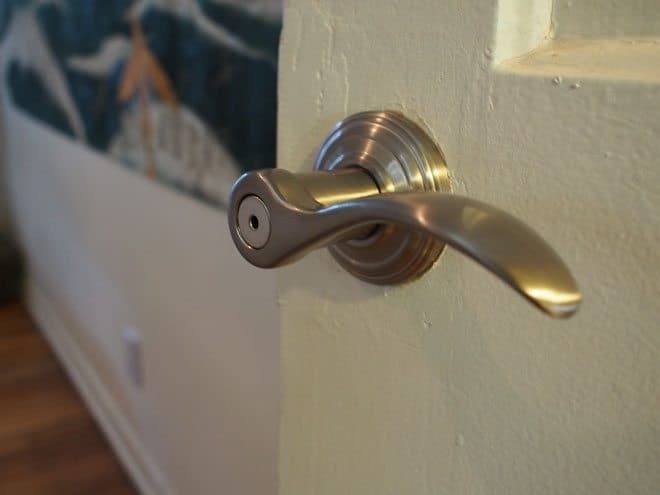 This all adds up to some compelling reasons to change our locks. 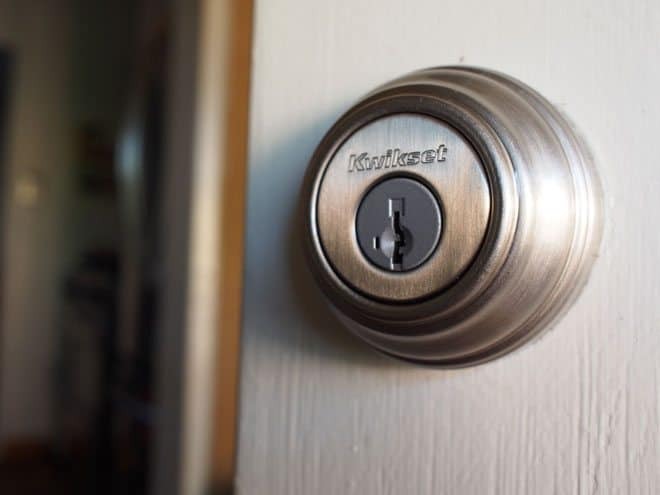 We’ve had great success with Kwikset’s SmartCode keyless entry system, and we really love the new Kevo SmartLock, but our solution was a bit more low-tech but just as effective. Our plan was to add double-cylinder locks to our three exterior house doors as well as to our separate studio and garage. And replace all of the door knobs with locking knobs. 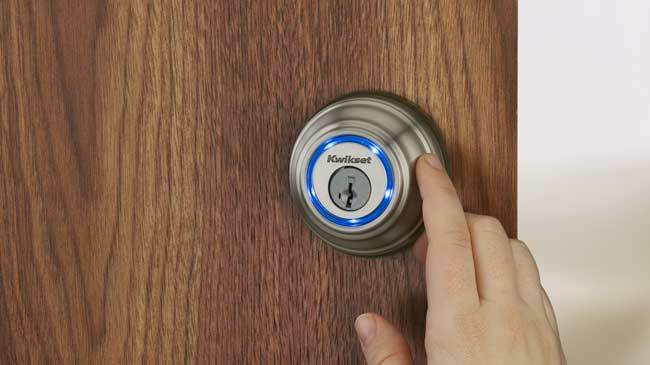 Kwikset’s SmartKey re-keying locks, solidified our choice for going with Kwikset all around. The SmartKey enables you to re-key any lock in just a few seconds. 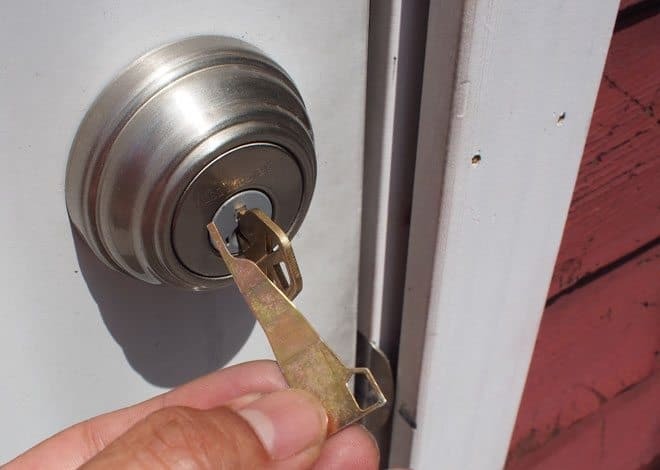 No more calling a locksmith or having to replace cylinders. Just use the included SmartKey which recalibrates the tumbler so it can accept and new key. You need to have the old key to make it work so there are no security concerns. We can now re-key our home if needed just for the cost of cutting new keys. Here’s the SmartKey shown being inserted into the slot next to the key. It’s a simple process for rekeying the locks. 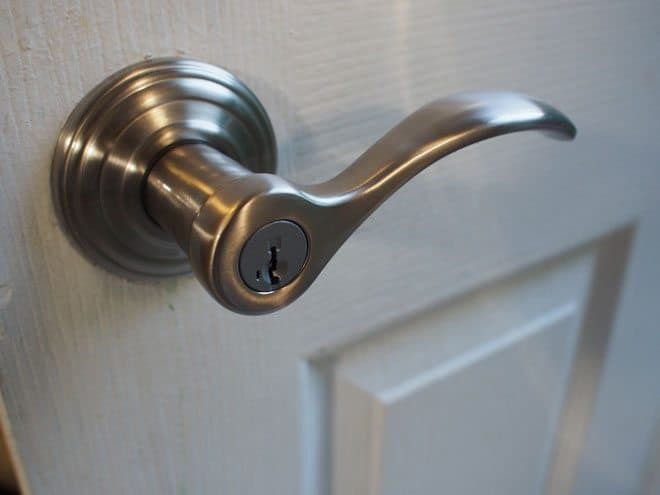 Kwikset’s website makes it easy to shop for locks and levers of all types, styles and finish. 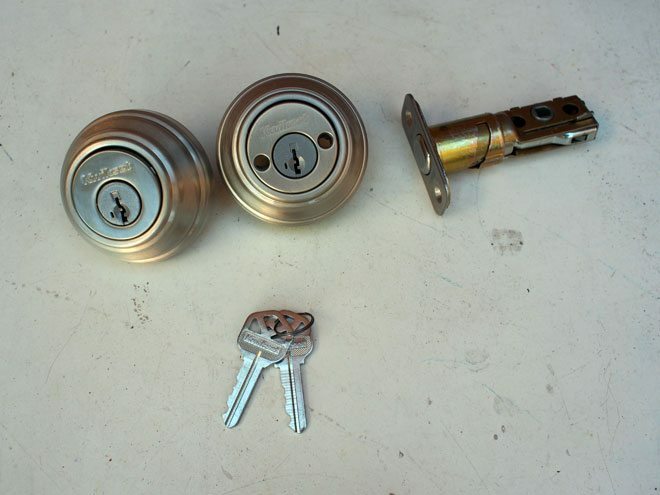 We went with a satin nickel finish on two doors and brass finish on the front door for this double cylinder deadbolt, and added Tustin keyed entry levers, also with SmartKey technology. Here’s the new knob next to the old one. The deadbolts locks screwed right in as well as the levers. The deadbolts and levers were basically plug and play and lined up perfectly with the existing strike plates and door jambs. After all of the locks are installed you simply choose a key to use as your master then use that to re-key all of the locks to. See the video below for instructions. Changing out all of our locks took a bit of time but has been well worth it considering the peace of mind we now have when we leave the house locked up for the day or for the week. The newest locks from Kwikset are BHMA/ANSI Grade 1 certified – the highest level of residential security. They feature patented side locking bar technology which offers improved security by protecting against lock bumping, an attack technique used to defeat conventional pin & tumbler locks. 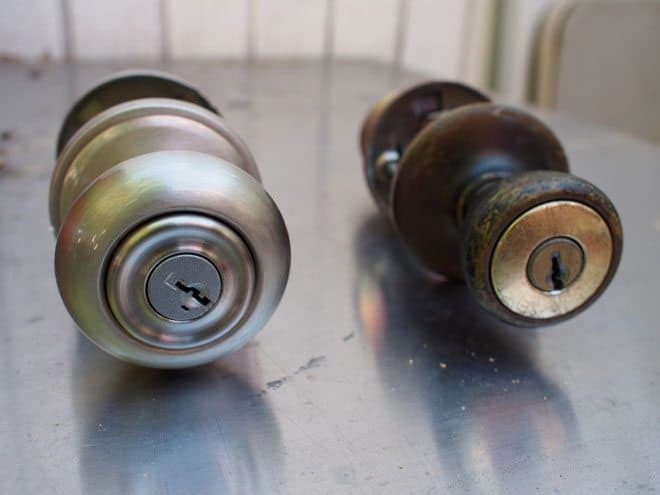 We highly recommend upgrading your deadbolt locks now, as waiting is often times too late.